People keep congratulating us -- like we've done something special. But people set challenges for themselves all the time, diet or otherwise. They succeed. They fail. They try again. But they don't do it with hundreds of people watching. So on this evening, during the last few hours of our little experiment, that's what I'm looking forward to most. Not breakfast, but the choice to choose what I eat without it being so public -- the choice to fail or succeed without letting anyone else down. Don't get me wrong. I've truly enjoyed most of this, but I'm not sure I could have done it without the pressure of everyone watching. So I don't feel that I have done anything that challenging or special. The people who are conquering real challenges are the raw foodists who are constantly bombarded with the memory and smells of cooked foods but resist eating them because they believe it is what is best for mind and body. One piece of sprouted-grain toast with organic butter and raw honey, chia seed and almond milk pudding and organic freshly squeezed oj. The rest of the day is for my eyes only. People have been asking me what's on the menu for my breakfast tomorrow, the first official meal outside the confines of this raw experiment. Answer: Probably a greens-and-fruit smoothie. You can read more in tomorrow's paper about what exactly the three of us plan to do, post-raw. But I'll just say this much. I wasn't looking at this challenge as, well a challenge. It wasn't an experiment of deprivation with the reward dangling at the end of 30 days to pig out. In fact, it didn't feel very depriving at all. I came to this month of raw out of curiosity, and to see if I could dust off some good health habits that had fallen to the wayside. I had a slow, frustrating start. But standing on this side of 30 days, I'd say mission accomplished. All these little steps that people have told me they're making can add up to big changes. I fully believe that. Last weekend, I finally had a chance to watch an advance review copy of "Raw for 30 Days", the documentary film that, in part, inspired our experiment. (None of us, however, came into this trying to treat a major health issue). The movie's new title is "Simply Raw: Reversing Diabetes in 30 Days" and it's set to premiere at the Newport International Film Festival in Rhode Island in June. It's a provocative film and worthwhile viewing for anyone exploring the connection between food and illness. Hopefully it'll spark an important conversation about the way we look at health and medicine in this country. So am I going 100 percent raw? I won't answer that right now. But the question is, if I do, do you think my editors will let me change my byline to Courant Raw Staff Writer? Today is the last day of our 30-day raw-food diet. First, to all my colleagues who predicted I'd quit halfway through, thbbbbbbbt! Seriously, though, I've learned a lot over the past month. Raw food is more than just twigs and berries, for one thing. In fact, it can be delicious, and was especially so Sunday night when we three went to Pure Food and Wine in New York. But it wasn't cheap. The diet as a whole isn't cheap. Raw foodists say the food bills normalize once you get a better sense of what, and how much, you'll be eating. But the diet just really isn't for me. I'll be incorporating all those things back into my diet, though I'll be much more watchful about how I do it. Making most of my meals at home, from natural ingredients, let me know exactly what I was eating, and I like that enough to not forswear it just for the sake of a cheeseburger. Well, not every day, at least. One of my main sticking points with raw has been this air of rigidity that swirls in certain circles. Even if you think you're doing a heckuva job eating 100 % raw, there's someone eager to point out that well, actually, those almonds you're eating aren't really raw, and you should be careful about how much fruit you're eating, and you shouldn't be drinking water with your meals, or eating fruit with your salad, and it sounds like you're getting too much salt -- no, not enough - no, too much salt in your diet. It can be paralyzing, this constant correcting. My first two weeks I had this sense that no matter how thoughtfully I went about my food choices, I somehow was still doing raw wrong. When you get these bits of discouragement coming at you from different directions, you just want to throw your hands up at the impossibility of it all. I can understand the enthusiasm people might have to share what's worked for them, but it can be counterproductive in what should be the real goal : to encourage people on the path to making healthier choices and give them reason to keep going. Otherwise, it just becomes about being able to wear the "100% raw" label. And who exactly is keeping score? Which is why our celebration dinner at Pure Food and Wine in New York on Sunday was so refreshing. 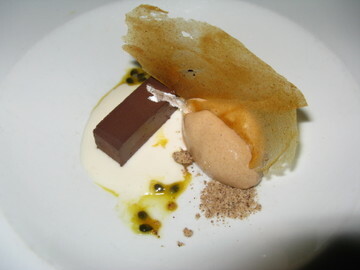 Forget the fact that the meal, from appetizer to dessert, was absolutely delicious, with each innovative dish presented like a little piece of artwork. But there was no sense of raw vs. cooked judgment around the dinner tables. About 14 or so people, all at their own levels of commitment to raw foods, came along with our raw coach, Glen. I particularly liked something that Frank Giglio said. A local raw food chef with an inspiring story, he just came back from a 10-month apprenticeship at The Tree of Life Rejuvenation Center in Arizona and is training for a 100-mile endurance run this summer. (That's not a typo. 100 miles. Non-stop. Fueled by raw foods. Really). 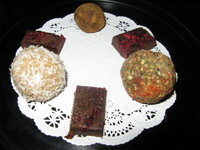 There are so many raw food gurus out there, he said, each with a different take. He suggested people not get so caught up in all their various "rules", but to take in all the information and try things on for size. What fits, keep. What doesn't, toss. Trust your intuition. He told a great story that bordered on parable about his friend, a vegan-raw foodist who lives out in the wild somewhere. She had been weak and underweight, and started having recurrent dreams about eggs -- not part of a vegan diet. When she woke one morning to find a chicken had laid an egg on her bed, she figured it was as clear a sign as any. Veganism aside, she started adding raw eggs to her smoothies. Sure enough, her strength and energy came back. My intuition tells me pretty strongly that I can skip that raw egg idea entirely. But now I'm wondering what to make of the weird dream that I had last night. I'll tell you if anything strange shows up on my bed tomorrow morning. 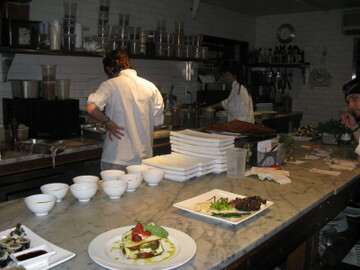 ...sneaking a peek in the kitchen at Pure Food and Wine. 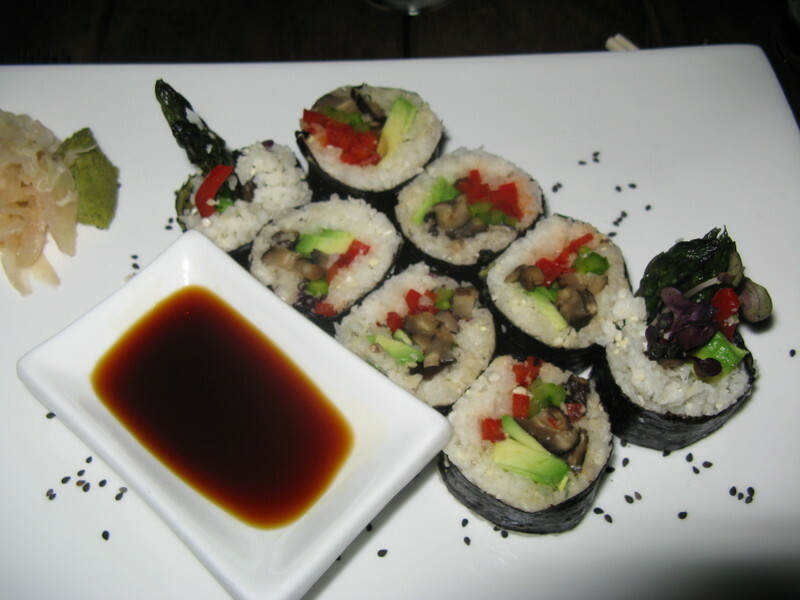 I had these asparagus and avocado nori rolls for an appetizer. (No, not sushi!) The rice, I'm told, is made from a jicama base. My main dish, a flavorful saag paneer with "rice." The flourless chocolate cake that Cindy and I had. She declared it "the best dessert I've ever had." This started out as the hardest weekend of all. So close to the finish line, yet still too far to go. I'm ready to be finished. So ready. During my trip to the market this weekend, I found myself stuffing my cart with goodies for my family. A horseradish cheddar. Marinated olives. Steaming, creamy lentil and coconut Thai soup. Then it hit me. These weren't foods my family wanted. These were foods I wanted. I bought it all anyway. I made them eat it. That was Saturday. Sunday was better. We didn't get home until 1:30 in the morning, so I'm running on about 4 hours of sleep today. In my pre-raw life, I would have dragged myself out of bed and been dragging myself around the rest of the day, counting the hours until bedtime. But I feel good. Good enough, in fact, that I'm going to the gym tonight. Not bad for the old gal in the group. Four weeks ago today, the three of us were getting set to dive into this uncooked lifestyle, not at all knowing what to expect. Would we be cranky and hungry? Would we take to it with raw abandon? Would Cindy and Eric still be my friends at the end of week one? We know the answers to some of those questions. But it ain't over yet. We still have a few days left. Still, our trio is celebrating the end of this monthlong experiment tonight, dining with our raw coach Glen Colello at Pure Food and Wine, considered one of the top raw gourmet restaurants in New York. It should be a great time. The menu is so enticing, with such creative-sounding dishes. I can't wait to check it all out, and raise a glass (of young coconut water) to toast my raw compadres. ...because who doesn't love pictures of (unusual) foodstuffs? As I mentioned, I brought back raw snacks that I picked up in New York last weekend to sample with Eric and Cindy. Some were bigger hits than others. 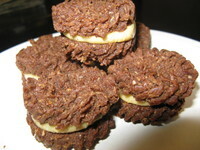 Raweos cookies? An obvious crowd pleaser. Soft and chewy, sweet and chocolatey? You can't go wrong. (Er, except for that $8 price tag. And that just gets you nine teensy morsels). The essene bread ($6 for a small box) and cashew cheese ($7.50 for a tiny knob) were tougher sells. 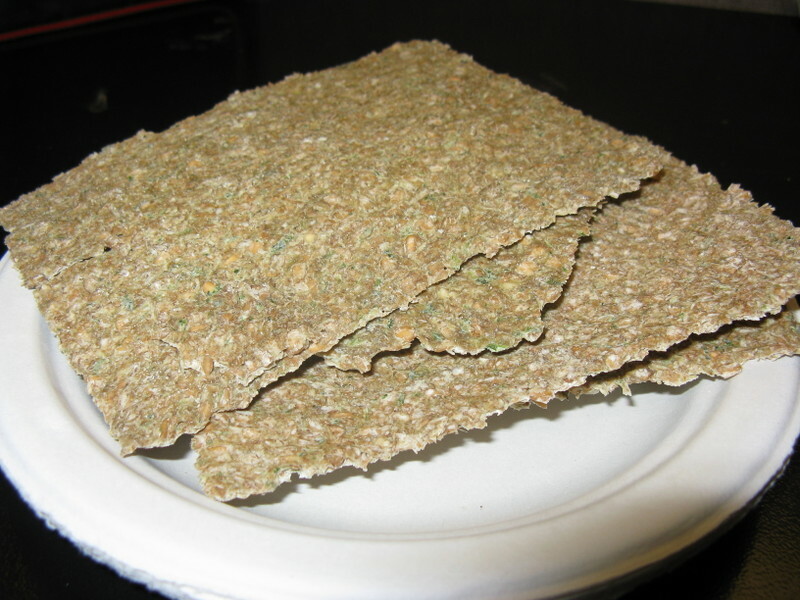 Made from dehydrated sprouted grains and vegetables, the "bread" is really more of a crispy cracker. I liked it okay, though it definitely goes better with a dip or spread. 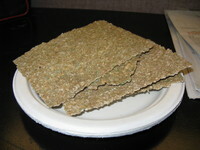 The others weren't so impressed, rendering it about as dry and flavorless as cardboard. I had high hopes for the cheese. But the truth is, cheese is cheese. There's no recreating it. 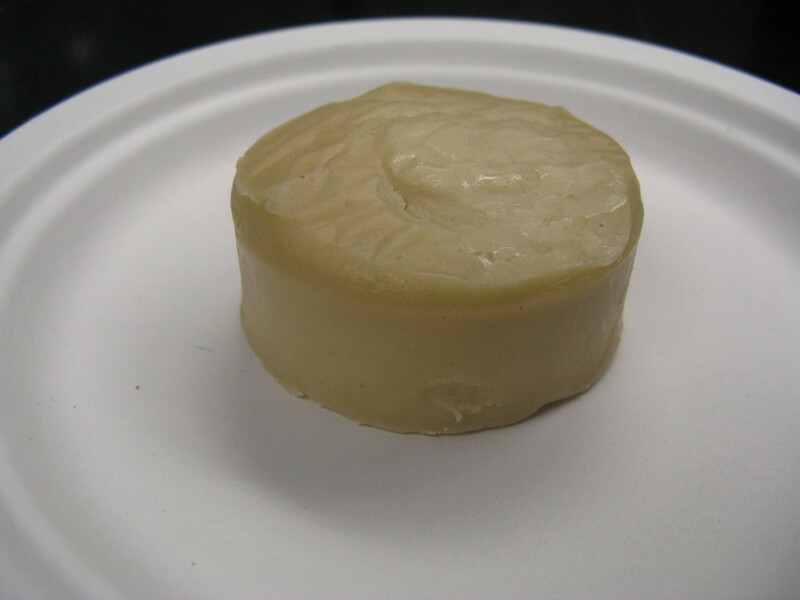 This one was made from cashews and a probiotic called acidophilus. It left a sour aftertaste, and, sadly, the remainder ended up in the trash can. Early on, the three of us bemoaned the lack of a cereal crunch in our diets. There are plenty of raw granola recipes around, but my issue with them is they tend to be heavy on the nuts. The folks over at Living Intentions got wind and sent us some samples of their soon-to-be-released granolas, made from sprouted buckwheat, sunflower and flax seeds and coconut, dried fruits and protein powders. 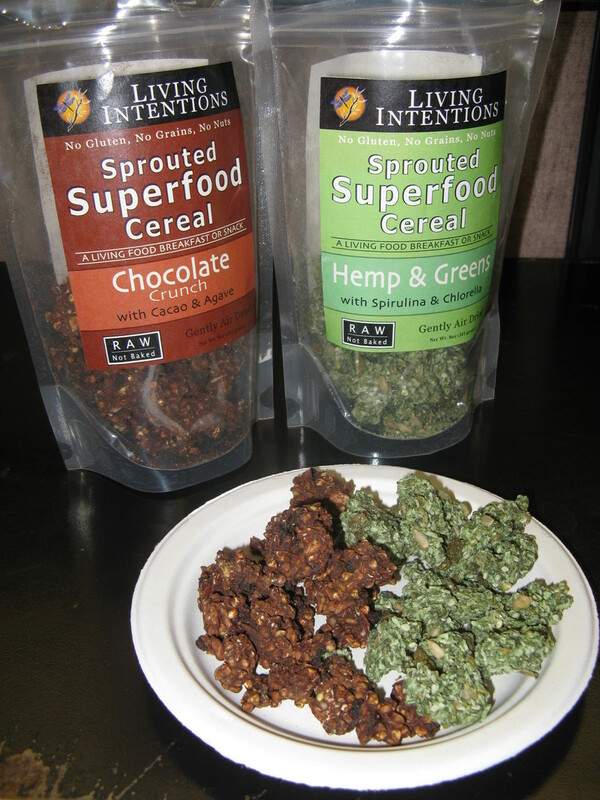 We sampled two kinds -- hemp & greens and cacao & agave. I had to shoo my (non-raw) colleagues' paws away from the cacao flavor, in particular. But I'll be snacking on both once they hit the stores. One last morsel for you to chew on. Our trio finally made it out for lunch together this week at Alchemy, an organic raw and vegan restaurant just a few minutes from the office. We noshed on great salads and smoothies (I had a tasty almond milk and chai concoction, and a hummus dip that was as close to the real thing that I've tasted). Once we were happily stuffed, co-owner John Zito brought out a plate of raw confections and melt-in-your-mouth chocolates. So rich and delicious, all you needed was a bite (or two) to satiate your sweet tooth. I think you have a good point, and I think you are right, on balance, in terms of how some Raw Foodists sometimes portray eating as about nutrients and perfection moreso than about pleasure. And I think those who get caught up in that way of thinking are missing the point. Having gone through my own repeated cycles of interest-excitement-disillusionment- rejection of a Raw Food lifestyle over the last handful of years, and having taken the 30-day plunge alongside you guys during this month, I think I’ve evolved to a new perspective on the whole thing. I don't think that eating can or should be a utilitarian venture. It SHOULD be pleasurable. I think that the real point to eating this way, and one that isn't discussed as much, is that eating optimally can escalate energy and clear-headedness, and actually starts to make one a little more alive in their own life, less weighed down by energy-depleting foods, and more available and energized to be all of what you are and can be. I know that when I eat better, I feel better, and when I feel better I work better, I play better, I interact better, and I show up in my life better. And THAT makes life richer. And that is the only reason to do it. A disconnect happens when it becomes about perfection or neurosis about what to eat and not to eat, and labeling some foods as bad or toxic. That kind of thinking becomes really counterproductive really quickly. Eating should never be about perfection or dogma and eating solely for nutrients will inevitably, I think, take people to that place where it's no longer pleasant, but is instead wrapped up in unconscious fear or anxiety. I know that the first week and half I was kinda unhappy with the food I was eating, and now that I've found some favorite meals and go-to snacks, I'm in the flow, and definitely it's pleasurable. I am decidedly NOT obsessing over perfection or about utilitarian fueling. This sort of stuff is personal and I really do think everyone needs to find their own way, separate of any dogma. Eating should be inextricably tied to following your own body's needs, and your own life's larger goals. And you can never find that by following someone else's rules. Inspired by ideas, yes, but following someone else's rules to the letter, no. I'm a bit of a contrarian anyway -- just ask Joann -- but there's a big piece of raw dogma that's been bothering me. Over the past few weeks, I've heard more than one raw-food enthusiast posit that the only reason for eating is to fuel the body by taking in nutrients. That's true, from a strict-constructionist perspective. But by that token, human beings have only three biological imperatives: Eating, defecating and reproducing. Still, I kind of like vinyl records. Point is, there's more to our lives, or should be, than the mechanics of living them. Regardless of my personal values (ahem), countless years of human evolution have turned eating into one of the chief ways we socialize. Reproduction has taken on the trappings of romance and love. I'd argue that life is richer as a result. Having Eric and Cindy along on this raw adventure has made the experience a whole lot easier. Diving in solo might have felt way too isolating and overwhelming. There's something to be said for having people to commiserate and compare notes with, in person and on a daily basis. I've also had the benefit of a third raw compatriot. My sister. She's dabbled in raw, but never went the distance and figured this was as good a time as any to take the plunge. The two of us are total health food dorks to begin with. We visit health food stores like fashion mavens do couture boutiques. We once snuck out of a family wedding reception to visit the tiny natural foods store next door, strolling the aisles with glee, palming bags of flax seeds like they were precious jewels. (Our family was none the wiser, too preoccupied with the Chicken Dance to notice). So when I visited her in New York last weekend, it was a given we'd go on a raw food excursion. If you're living raw, hers is probably one of the best neighborhoods in the country to do it in. From shops, gourmet restaurants and juice joints, there are easily a dozen live foods resources within an 8-block radius of her. Here in Connecticut we've got places like Alchemy in Hartford and Catch a Healthy Habit Cafe in West Haven. But it's far from the hub my sister enjoys. If she doesn't feel like messing around in the kitchen, she can easily stop into the takeaway cafe at one of the top raw food resturants in the country, Pure Food and Wine, or head down to Quintessence or Caravan of Dreams. She's totally a little raw spoiled brat. 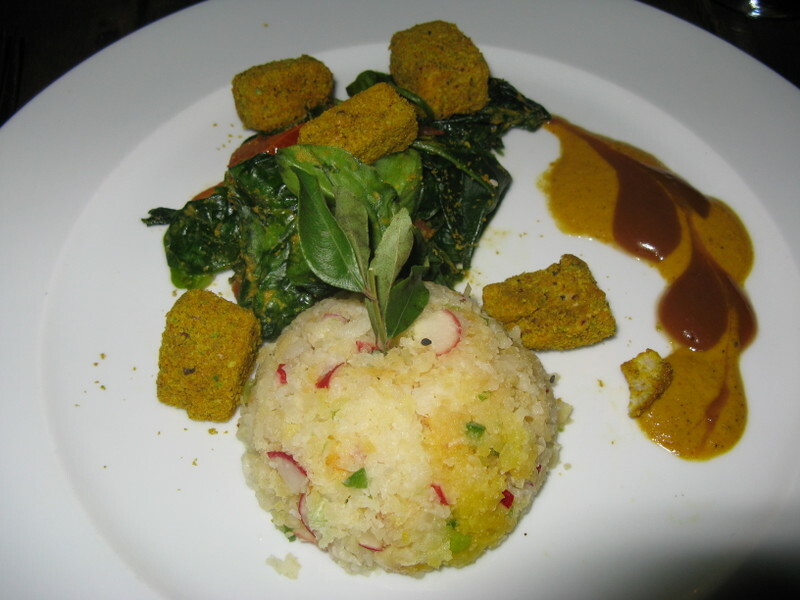 We started with a great dinner Saturday night a Candle 79, a gourmet organic vegan restaurant. It was such a relief not to have "the raw talk" with a waitress, or surrender to a puny house salad. Candle isn't fully raw, but they've got enough items on menu to make it a breeze. 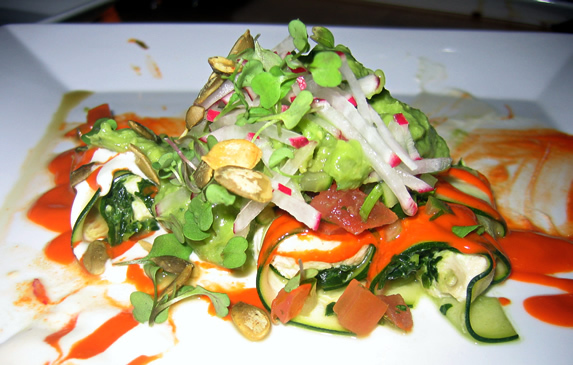 So, we sipped on young coconut water and shared our plates of avocado-tomato tartare, seaweed salad and and live zucchini enchiladas, made with cashew cheese and chipotle tomato sauce. 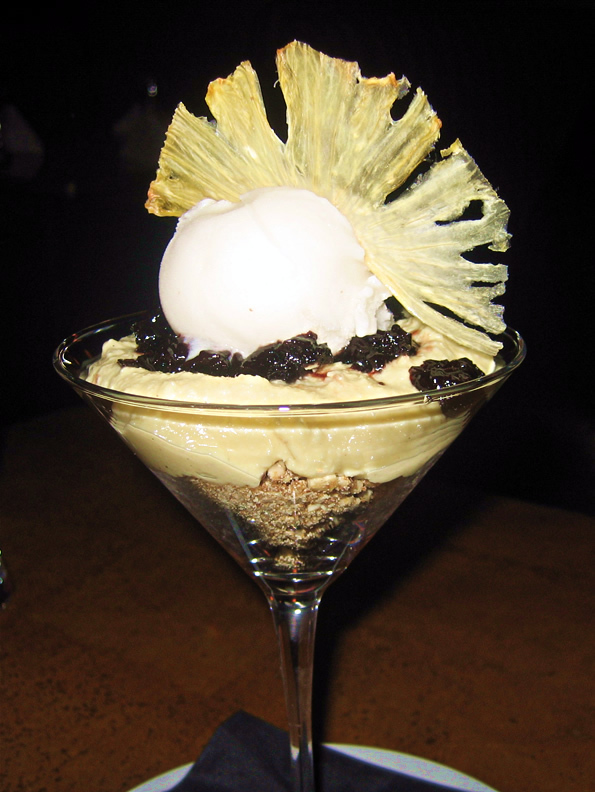 For dessert, we split an amazing live pineapple-cherry parfait with nut granola and raw coconut ice cream. It was all totally satisfying. But watching the staff trot out hot, savory dishes to nearby diners -- well, it was the first time I really craved a hot bite of comfort food. We spent the next day whipping up our own breakfast smoothies, and later headed up to Bonobo's for a live foods lunch. We had actually only intended on peeking inside since we were passing through the neighborhood. But the sight of the colorful salad bar selections convinced us to pull up a chair and order a combination platter of various marinaded, seasoned vegetable salads. We capped off the raw adventure by heading back down to two East Village shops: High Vibe and Live Live. I stocked up on snacks of essene bread (made from dehydrated sprouted grains and vegetable), cashew cheese and a raw version of Oreo cookies to share with Cindy and Eric. And my sister shelled out $14 for a package of raw tortillas. Cha-ching, indeed.